For a year or more, the west Wiltshire market town of Warminster was the talk of the country – after a strange sound, and then weird flying objects sent townsfolk into a spin. And now, 50 years after ‘the Warminster Thing’ – Britain’s first UFO ‘flap’ which actually lasted for decades – a major conference event is to take place in the town. The one-night event will be held over the August Bank Holiday – exactly 50 years after the ‘flap’ became national news and the town was flooded with the curious. Warminster remained the national capital of all things UFO right through the 1960s and 70s, and enjoyed something of a resurgence with the crop circle phenomenon of the 1980s and 90s. The phenomenon began slowly, with reports of strange noises making tiny titbits in the local paper late in 1964 and early in 1965. Then newspapers including the Western Daily Press began reporting eyewitness accounts of strange objects and lights in the sky, both day and night, in the town in the spring and summer of 1965. 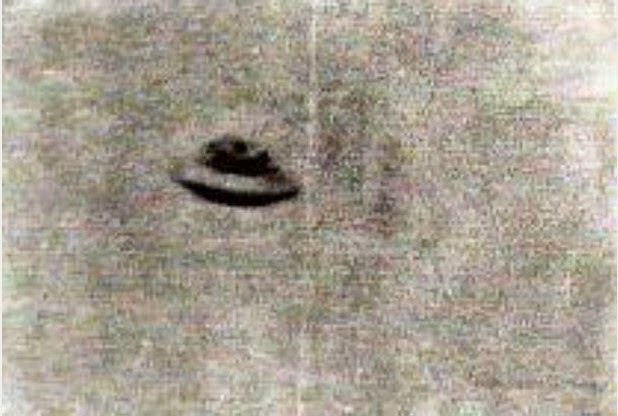 In August of that summer, such was the furore that the town council held a public meeting to allow worried residents to debate what exactly was going on, and the national media went along and the Warminster Thing became an international phenomenon, boosted by a controversial photograph of a flying saucer taken by local man Gordon Faulkner. The following weekend was August Bank Holiday, and they came in their thousands from all over the country to see for themselves. Some never left – for years afterwards, the two large hills, Cley Hill and Cradle Hill, were packed on most nights in the spring and summer with skywatchers determined to see their own strange lights in the sky. At one point both David Bowie and Mick Jagger made their way to Warminster, along with thousands of others over the ensuing years, as the town’s status as the headquarters of Britain’s UFO phenomenon continued well into the 1970s. The phenomenon and the story surrounding it was captured in this remarkable documentary in 1990. The event is being held at the Old Bell in Warminster’s town centre and is organised by mystery author Kevin Goodman, who wrote books on the phenomenon including Cradle of Contact and History of a Mystery. A number of speakers are attending the one-off event, including UFO expert Peter Paget, who set up a research centre in the town in the 1970s. For more information, go to the 'Warminster 2015' page on Facebook.